← Why do Welsh Psychiatrists say I need a Neurologist when HHJ Stacy Lloyd-Clarke cannot even find me a Welsh Psychiatrist? Now Cardiff County Court Again Block Machine-Gun/MAPPA Data Disclosure for HHJ Tracy Lloyd-Clarke next week! Royal Courts of Justice Application to Appeal A2/2017/2747 re my not just having been unlawfully registered as a MAPPA level 3 category 3 victim, to double my prison term but to prevent urgent medical care from two pre a-arranged hospital appointments (police prevented them as ‘I was deemed, ‘too dangerous’). Tomorrow’s machine-gun judge, HHJ Keiser QC had steam-rollered this case through the hearings at such pace Justice Ministry, police and Parole board barristers and their respective entourages all admitted they had been left way behind, in the rush and quite unprepared to be paid out in cash, that afternoon, as was His Honour’s expressed intention. The learned welsh judge, when striking out the claim despite no document disclosure disclosure of WHATEVER I WAS SUPPOSED TO HAVE DONE for the need of my recall for a further eight months to prison without trial or the routing parole board hearing required in an English prison. South Wales Police first black mailed NHS (Wales) staff at Caswell Clinic in 2009 and now have blackmailed my lawyer specifically instructed to act on my behalf at all three above court cases because the evilness was hatched in South Wales police HQ in 1993 by first sending me to Cardiff prison, for an indefinite period, as being ‘unidentifiable’, anything to avoid the civil claim against them affecting the lucrative pension. Despite the panic shredding of HMCS files, prison and police records to assist the criminal trial judge, next week, in her deliberations……the truth will eventually come out before my 10th jury on the matter, if need be. 1. Please apply to the appropriate welsh authorities asap for the data they still have on me despite my many previous attempts for disclosure surrounding my South Wales Police MAPPA registration in order to getting me killed. 2. This victim of the current welsh judiciary has employed, over three decades, numerous lawyers to act on his behalf with significantly differing results. Today, six sets of lawyers are employed to expose the clumsy attempt by the then Chief Constable of Couth Wales Constabulary having me MAPPA level 3 category 3 terrorist registered in order to have me ‘lawfully’ shot. When that murder failed this victim was then ‘set up’ by the same police force, at the notorious Cardiff Crown Court, in his forced absence and whilst legally unrepresented, to be detained in Ashworth high security psychiatric hospital, hopefully for life. This was in order to block his civil claims of around 40, by now, failed police malicious prosecutions. When that also failed to stop the already 20 year delayed civil claims, the welsh civil trial judge, His Honour Judge Seys Llewellyn QC, refused his victim a jury and for it to be heard in England, both promised at the very beginning or it would never have been started. When that hearing was delayed for many more unnecessary years from getting to the RCJ it finally ‘got there’ in October 2015. ‘Got there’ in the Appellant’s arms only to be refused for a further 16 months by Cardiff County Court repeatedly refusing to simply seal the judgement, meaning, ‘just stamp the bloody thing’. The Cardiff cabal achieved not just the the decades of delay for the Claimant’s 200 odd witnesses to forget the facts, emigrate, be committed to mental homes or simply die off, the cabal had now arranged for the original appeal not to be ‘eligible’ before the RCJ but only for ‘consideration’ back the their own local cesspit, the Cardiff Civil Justice Centre. The Cardiff cabal, meantime, also had destroyed both civil and criminal court papers, court logs and shredded the decades of tape recordings all vitally needed to expose this multifaceted conspiracy at the RCJ appeal. All these records related to the systematic, so easily proved, perverting the course of justice as needed before the civil court, tomorrow, before HHJ Keiser QC and Crown Court, next week, before HHJ Tracy Lloyd-Clarke. c) Claimant not having been informed of any communications between parties and /or the court despite HHJ Keiser QC having ‘struck out’ my civil claim for the police having fabricated my forensic history to have my prison term doubled, to further prejudice BS614159 etc /machine gun & alleged breach of a restraining order, never served on their victim in the first place. d) Claimant’s outcome of his medical examination by a NHS (Wales), not NHS (England) as ordered by the Cardiff Crown Court. 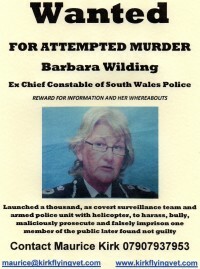 Please find attached the South Wales Police current attempt to further pervert the current criminal proceedings by having, so far, successfully blocked the the disclosure, over eight years, of my fabricated forensic history, when having identified I am suffering from a possible brain tumour, CPS quote but none of them with the moral fibre to inform me or arrange appropriate follow-up medical care. Despite my using the ‘rule of law’ , as we are at custom to rely on in civilised England, to reveal to my next jury trial the wickedness in this continuing apparent Crown Court cover-up, the police are now not just blackmailing of NHS (Wales) staff, in order to have me locked away, for life, in Ashworth, but preventing me having independent legal representation. The enclosed police lawyer’s application is deliberate to interfere with the information withheld by Dolmans for the South Wales Police and numerous HM Crown Prosecution lawyers, over the years, including current barrister, Michael Smyth by his own admission. I applied for these above trials to to be heard without the real risk of ‘bias’, in England but refused. More outrageous and totally unacceptable treatment from the Welsh court employees – a burden on everyone else who has a conscience!! How long is ‘an instance’ Madam,you lying little welshing b–ch somewhere towards the bottom of the sh– heap of shy–ers that make-up the Wales judiciary and South Wales Police force? Of course your court are in touch with RCJ ( see my last letter in your direction). I travelled by train twice, posted the lot once as you lot very well know, to the RCJ with my 2016/2017 appeal applications, after being made to wait 25 years to do it, prepared at great expense and time only to be refused at the counter each time as there was no ‘sealed order’ …..Wrong court, of course, in any event but no one told me …All of you thought it all a bit of fun to run a Litigant in Person a song and dance for another 10 years. If any one needed turning up-side down …………………………………….. Your inherent deceit oozes from every one of your sweaty glands every time I see you…..Remember my shredded court ‘ vexatious litigant file’, remember my snatched files to Whitehall shredded, remember all my court destroyed court exhibits for the BS614159 25 year running case, but your pension is protected under HM and withdaft Brexit your future in HM is well assured. Will you send me copy or to any of my family, when I am gone, of the BS614159 court management log? Of course you cannot , that was systematically shredded at the end of each day you thoroughly deceitful individuals. 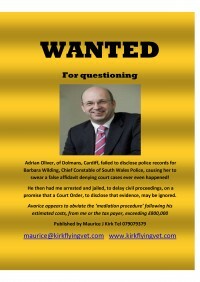 Please can you provide me with a contact at the court of appeal. If you provide me with a name, I will in this instance only, send them a sealed copy of the judgment dated 26th October 2015. Do you need to print this mail? Oes angen ichi brintio’r neges hon? Unsubscribe to no longer receive posts from VICTIMS OF THE STATE. MY wordpress site state is fine…. remove no more FROM ANY OF YOURS as I asked at the 17th Nov hearing of the situation..with Judge Tracy Lloyd . 1 Response to Now Cardiff County Court Again Block Machine-Gun/MAPPA Data Disclosure for HHJ Tracy Lloyd-Clarke next week!